Harvest takes place in early June harvest and only the most aromatic varieties of Freestone and Clingstone Georgia Peaches are destoned, juiced and blended in preparation for this refined American Whiskey. It is the hint of sweetness at the forefront, originating from real Georgia peaches, not artificial flavours or colours, which one notices first as they savour this unique spirit. Like any true American whiskey, however, the subtlety is in the finish. 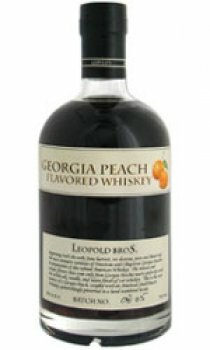 Since the whiskey is blended with real Georgia Peaches and then is gently aged in used bourbon barrels, the rounded finish of this whiskey contains notes of oak, vanilla, and raisin. This same oakiness is also echoed throughout the aroma and body of this classic spirit. The result of this painstakingly slow process yields just under 20 cases of a smooth whiskey with the intense flavours and aroma of some of the best peaches the world has to offer. Each batch is numbered by hand, reinforcing the uniqueness of this handcrafted spirit.